At Absolute Pest Control, we know how important it is to have a termite letter, (also known as a CL - 100 or wood infestation report) completed before closing on a home. 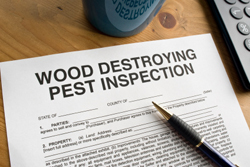 We have unfortunately seen many instances where home owners lost thousands of dollars by not having their home properly inspected through the use of a termite letter Before you invest a lot of money into a new or used home, we ask that you contact the pest control experts at Absolute Pest Control to perform your wood infestation report. We ask that you remember that termites and other pests are very common in these areas and we strongly suggest that you schedule an inspection, before closing on a home. A wood infestation report or termite letter must be done before closing on a home, to avoid any major future problems with the home. We ask that you make sure to contact us before closing, to ensure that you are not making a major financial mistake with the home you are about to purchase. A termite letter covers many other areas besides just termites such as excessive moisture or fungi, damage from beetles, and wood rot from the flooring to the ground. There are areas that are not covered in the termite letter such as the eaves of the home, wood rot around areas including garages, and detached buildings. If you have any questions about what would or would not be covered in a termite letter please make sure to contact us. A friendly staff member will help you with any questions. We highly suggest that you have the termite letter done within 30 days of closing, to ensure that any and all problems are found. Also, this is recommended since the termite report is only good for a maximum of 45 days in the state of South Carolina. We will make all recommendations in regards to what needs to be fixed within the wood infestation report. If you have any questions for our pest control company regarding a termite letter or other services, please feel free to contact us. We ask that avoid any mistakes when buying a home by requesting inspection from the most experienced company in the area at Absolute Pest Control "The Name Says It All". For CL-100's please contact our office at 843-397-7378.